Yep, we’ve got a reading assignment for you. But trust us, it’s an important one. Each year for Sexual Assault Awareness Month (aka #SAAM) the Kent County Sexual Assault Prevention Action Team puts together a newsletter. It’s a great way to read up on sexual assault and how we are fighting it locally. 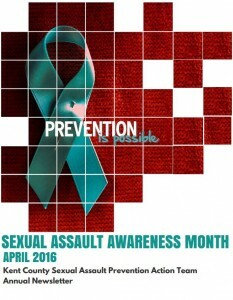 Click here to read the 2016 Sexual Assault Awareness Month newsletter. You can learn how preventing sexual violence IS possible. You might even spot a cameo by us YLAVers… and of course, Lady Gaga.